Pregnancy is a time full of wonder, excitement and much preparation. Children often exhibit curiosity about their birth, especially when their own mother becomes pregnant. My daughter poured over the new baby and sibling themed books I brought home before her brother was born. It helped her prepare for a sibling, and she never seemed to exhibit an "adjustment period" because we involved her in the pregnancy. She especially loved hearing stories of when she was a baby growing inside my belly. 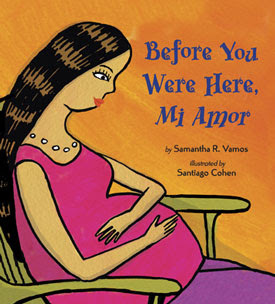 The newest "new baby" book out right now is an exceptional bilingual picture book by Samantha Vamos titled Before You Were Here, Mi Amor . In her book, Vamos describes a family's actions and thoughts as they prepare for a new baby's arrival. Told from the mother's loving viewpoint, the sweet, heartwarming story includes several family members--a father, brother, sister, grandfather, grandmother, uncle and aunt all helping out in some way. For example, Abuela (grandmother) carefully paints un cocodrilo, dos elefantes, and tres tigres on the baby's bedroom wall. Using a unique writing style, Vamos effortlessly blends basic Spanish words into English sentences. Colors, shapes, numbers, and all sorts of useful "beginner" Spanish terms are brought to life in Santiago Cohen's colorful, expressive illustrations that perfectly complement and add clarity to the text. A back-page glossary translates all the Spanish words used in the book. While this book would obviously appeal to children of Hispanic/Latin descent, Vamos' creative use of numerous "beginner" Spanish terms also makes the book an ideal resource for families interested in teaching Spanish as a second language to their children. The book would make an appropriate gift for an expecting or new mother as well. Parents magazine just featured Before You Were Here, Mi Amor in the May 2009 issue. My preschool-aged daughter easily picked up numerous Spanish phrases by reading this book along with me. She really liked the page showing the sister's drawing of the family for the baby. She drew one exactly like it for her baby brother before his birth. I must admit I stumbled some while reading the Spanish words. Luckily we were able to listen to a audio version on Cody's Cuentos so that we could learn the correct pronunciations of the many Spanish words. One last thing--I love that Cohen drew a mustache wearing father. My own father has sported one ever since I can remember but I rarely see a father with a mustache depicted in picture books. Hmmm, now I'm left wondering, what is the Spanish word for mustache? Parents Magazine article "Books to Help Teach Kids About the World"
Win a copy! Samantha Vamos has kindly offered to give away a copy of Before You Were Here, Mi Amor to a Brimful Curiosities reader. To enter, leave a comment relevant to this book review post or visit Samantha Vamos's website and let me know what you like best about it. • Contest ends on Monday, June 1st, 2009 at 11:59 PM CST. That book looks fantastic - just the title grabs you! I began learning Spanish in high school and took at least one class every semester through college. I would love to have this to have my son hear some spanish words from the beginning! I am a subscriber through google reader! I liked the activities to go along with the book on her site. Great idea! I love the vivid colors and bright, happy music on her website. I'm following you, Google and Twitter, thanks! Having my bi-lingual, Ecuadorian-American baby in October. I would love to read this to the little one! That sounds like a great book. Have a wonderful weekend! By the way, how is the weather back in Wisconsin? Is it getting warm yet? I talked to my parents a couple of days ago and they said it was still a little chilly. I love the fact that this books was featured in Parents magazine. Way to Go Samantha R. Vamos. I would love to share this books with my grandson, Carter. Please include me in your giveaway. This sounds like a wonderful book. I love that it incorporates both English and Spanish, and can help little ones feel more ready for a sibling. Over on her site, I really like the word match. It would be a great teaching tool. I love the bilingual aspects. Please enter me! I'm always drawn to children's books with fun illustrations and lyrical text. This book appears to offer both. I am very interested in teaching my 2-year-old daughter Spanish and reading this book together would be a good start. I visted her site and I like the visual layout (the flowers espe) and the topic -- bi lingual. We have a toddler and a baby on the way - this would be great to read to my daughter! I love that the book is bilingual - language learning is so important and learning a second language is great for brain development. Plus the book sounds fabulous. I love the title and the way that the subject matter is presented. Very relavant for our times. No need to enter me; just posted on Win A Book. This looks great! It's perfect for my bilingual sister in law and her young girl, too! I like that it teaches Spanish words to children. Thanks. I like this book because I have one grandson that is part Puerto Rican/Italian and he could learn simple Spanish words. Thanks. No need to enter me. It will be posted on my next Giveaways Galore post, this weekend. I would love to win this for my neighbor who is trying to teach her child Spanish. Thanks for the wonderful giveaway. I love the illustrations, and positive message! I totally get what you're saying about how kids love to hear their birth story. My almost 3-year-old daughter just asked me to tell her the story tonight. She has always liked listening to it, but I think now more than before, because she is about to become the "big sister". Thanks to both you and Samantha R. Vamos for the giveaway! My sister is raising her first baby in a bilingual household, and I know she'd adore this book. What a great trailer! I'm now a subscriber via email. I was reading parents magazine and I saw this book and I though that it would be wonderful to have it. My son has been asking me were he was before my husband and I got married and I think books like this will help us to answer this questions in a better way. I'm happy so know that you have a giveaway about it. And I would like to participate in it. I love books such as this one that have beginner's Spanish words in them. My daughter loves books so much that she picks right up on lots of news words when I read to her. Oh this book looks maravilloso! I am 39 weeks along and due any day so I was super excited to read your review! Please enter me in the giveaway! I love how this book uses both English and Spanish. While I am not bilingual I really hope to teach Brea some spanish when she is little. I think this book would be an excellent help!